"Kolekole," "Barking Sands," and "Diamondhead" have been under way by the 25th Inf. Div. since the middle of May and are producing good results in both pacification and destroying VC communication and supply lines. The 2nd Bde. operation is Kolekole being conducted southwest of the Cu Chi base camp. Barking Sands is the 1st Bde. Operation and is in the general area north and northeast of the camp. The 3rd Bde. of the 7th Inf. Div. is working on Diamondhead between Tay Ninh and Dau Tieng. Maj. Louis Jennings, the assistant civic action officer for the division, stated "We are tied in very closely with the National Police and the Vietnamese Information Service." The police, with U.S. forces seal off a village. Occupants are then checked for proper identification and questioned concerning VC movement and action. The VIS passes out material in support of the Vietnamese government and its programs. The 25th civic action team then goes to work. Many times a MEDCAP is held. Papers and magazines are passed out and a plea is made to villagers to report VC and locations of mines or weapons. Sometimes the 25th Inf. Div. band goes to the village with the team and gives a concert. Clothing and food are given away as well as sanitary and health items. Jennings said, "Some of the villages are just like ghost towns when we first arrive." Generally it doesn't take long for the people to begin filtering out, however. On the tactical side of the actions of the three brigades more than 90 Viet Cong have been killed. To date there have been 246 detainees. Kolekole has netted 1350 rounds of small arms ammunition, while Barking Sands is credited with 1093 rounds and the Diamondhead count is 379. A Viet Cong a day for four days straight was the result of a successful ambush patrol conducted by the second platoon of Co. C 4th Bn. 9th Inf. "Manchu." The company patrol was set up along a trail suspected to be part of an enemy supply route between the Cau Truong Chua River and a small hamlet about 5 kms northeast of Trang Bang in Tay Ninh Province. Just as darkness was closing in the four Viet Cong came walking casually down the trail. The ambush was sprung. One of the enemy was killed but the others escaped into the trees leaving all four of their rifles behind. The next morning a Viet Cong came into the "Manchu" field camp proudly displaying his "Chieu Hoi" pass and asking to switch from the side of the Viet Cong to the Government of Vietnam. Upon questioning by the battalion interpreter it was discovered that this Hoi Chanh was one of the four who had been ambushed by the patrol the evening before. He stated that the VC who had been killed had been the assistant commander of a local guerrilla unit. Another man had been seriously wounded during the action and would probably die soon. Three days later another VC turned himself in to a nearby ARVN outpost. It was soon learned that he too had been in the ambush two nights earlier. He further elaborated on the ambush testifying that the previous day the man who had been wounded had died. This man, he said, was an intelligence officer for the Viet Cong. The leader of the ambush was 1LT Glen Crummie, 26, of Fayetteville, N.C. He stated, "The Viet Cong we are finding in this area are part of the guerrilla forces recently driven from the Boi Loi woods during Operation Manhattan." Units of the 2nd Bde., 25th Inf. Div.. treated more than 4000 Vietnamese civilians during the first month of Operation "Kolekole." The wide ranging brigade operation is centered in Hau Nghia Province. The record number of patients were treated during Medical Civic Action Programs (MEDCAPs). The programs utilize American military medical men to treat Vietnamese civilians. In many cases, there is no other source of medical attention for the people of the hamlets . "This has been the most concentrated MEDCAP effort ever conducted within the brigade," said Major Gordon Corcoran, the unit's Civil Affairs officer. "It has given us the chance to do a great deal of good in the hamlets in a very short time." The vil1ages range throughout Hau Nghia province, but attention has been focused on the heavily populated areas near Duc Hoa and Bau Trai. Medical care has been supplied by surgeons from the brigade headquarters, 1st and 2nd Bn.s, 27th Inf. ; 1st Bn. (Mech), 5th Inf. ; and the 1st Bn., 8th Arty. Search and seal operations often accompany the MEDCAP. The hamlet is sealed before dawn and thoroughly searched. Intelligence personnel question villagers and Civil Affairs officers explain the Allied effort to the people. Finally, a medical treatment station is set up, and doctors treat ailing villagers. Operation "Kolekole" combines combat objectives with Revolutionary Development goals aimed at bettering the lives of Hau Nghia civilians. When you get a flat on a $30,000 armored personnel carrier, you've got a problem. Especially when it was caused by a Viet Cong mine. The 1st Bn. (Mech), 5th Inf. 's answer is a forward combat repair section that can handle all but major battle damage. The unit, part of the 25th Inf. Div. 2nd Bde. has one and one-half years experience in repairing the enemy's handiwork. It was the first mechanized unit in Vietnam. "When a carrier stops functioning a whole squad of soldiers is out of business," said Cpt. Charles Watkins of Monroe, La., the battalion motor officer. "The forward repair section insures that they'll be chasing VC again in the shortest possible time." The section is usually seven men strong. Most are extensively trained in tracked vehicle maintenance. Thirty-two weeks schooling puts them on an intimate basis with every square inch of the combat vehicle. Many tools they use are improvised. About half their issued tools were eliminated by a Viet Cong mortar round recently. Soldier ingenuity more than made up the difference. In addition to making up for the destruction, the men have come up with new ideas of their own. One is an A-frame winch, mounted on a carrier that can change a complete engine assembly on the spot. "With our field gear we handle four or five immediate repair jobs a day," said mechanic SP5 Michael Kassaback. "With more than fifty carriers in the battalion we keep pretty busy." The Viet Cong have a bounty on snipers. But this doesn't scare "Tropic Lightning" soldiers from the 25th Inf. Div. who are taking a new intensive sniper training course. The course runs eight hours daily for seven days at the division's Lightning Ambush Academy's firing range. The potential snipers are all expert riflemen. Each has six or more months remaining in Vietnam and are selected from the division's three brigades. According to instructor SSG Frank Kelly of Philadelphia, Pa., there are three prerequisites a soldier must possess before he becomes a sniper. "He must be able to shoot accurately, he must have patience and endurance and finally he must have courage." The most successful attribute is patience because the sniper will rarely fire more than two shots. Snipers have a two-fold mission: to harass and kill the enemy and to gather and pass on intelligence reports on enemy movements. 1LT Don Stamper of Port Pleasant, W. Va., commandant of the Ambush Academy, remarked, "Our course is fairly extensive. Among other things, we teach methods of employment, concealment, camouflage and zeroing the weapon with a scope." At the end of the seven-day exercise, the academy gives a graded exam to learn how effective the courage has been. The theory behind the instruction is that good, accurate, long-range snipers can prove demoralizing to the enemy. Carefully deployed, the hidden rifleman can observe enemy troop movements and interdict Viet Cong tax collectors, mail runners and propaganda agents. SSG Devere Cronk of Gladwin, Mich., another instructor at the sniper school, asserted, "If we have a group of physically-hardened snipers operating from outside a large body of troops, they would be able to engage individual targets a lot easier." 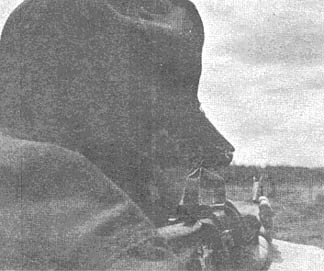 After completing the training, each sniper is assigned to a two-man team. Each will have an accurized M-14 or M-16 equipped with a variable-power scope. Col. Doniphan Carter has assumed command of the 25th Inf. Div. 's 1st Bde., replacing LTC Thomas A. Ware Jr. The change of command ceremony was held at the brigade's field camp at Bao Dong, 28 kms northwest of Cu Chi. In attendance were MG John C. F. Tillson, commander of the "Tropic Lightning" division and commanders from the 1st Bde. Carter comes to Vietnam from the Pentagon where he was the executive officer for the Deputy Under Secretary of the Army. Prior to this he attended the Naval War College at Norfolk Va., for 10 months. A 1944 graduate of the United States Military Academy at West Point, the colonel has since received masters degrees from George Washington University in Personnel Management and International Affairs. This is Carter's third combat assignment. In 1945 he was awarded the Silver Star and his first Combat Infantryman's Badge for action in WWII. In 1952 he won his second CIB while serving with the 179th Inf. in the Republic of Korea. He has won the Bronze Star Medal with two oak leaf clusters. Col. Carter's overseas tours of duty include service in Europe and South Korea. 1LT Thomas B. Sharp, Trp. B, 3rd Sqdn., 4th Cav. PSG Samuel E. Jenkins, Co. C, 1st Bn. (Mech), 5th Inf. SP4 Larry Wilson, Co. B, 1st Bn. (Mech), 5th Inf. 1LT Joseph H. Brown, Co. C, 2nd Bn., 27th Inf. 1LT Martin W. Pinnock, Co. B, 2nd Bn., 27th Inf. SP4 Calixto F. Garcia, Btry. A, 2nd Bn., 77th Arty. SP4 Kenneth L. Klauser, Btry. B, 2nd Bn., 77th Arty SP4 Kenneth W. Klumb, Co. C, 2nd Bn. (Mech), 22nd Inf. SP4 Roland Matthews, Co. A, 3rd Bn., 22nd Inf. PFC Robert W. Edwards, Btry. A, 7th Bn., 11th Arty. PFC Brian F. Gibbons, Co. B, 3rd Bn., 22nd Inf. MAJ Jerry E. Ward, HHC, 266th S&S Bn. CPT David N. Shaw, 25th Med. Bn. 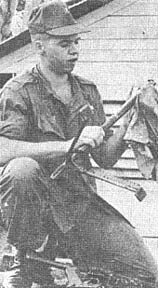 CPT Ronald D. Steinig, HHC, 25th Inf. Div. CPT Robert M. Weekly, Btry. A, 2nd Bn., 13th Arty. 1LT Michael E. Gersten, 25th MP Co.
1LT Roger R. Renn, 25th Repl. Det. 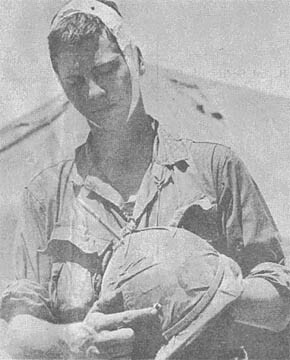 1LT Robert Sylvester, Btry. B, 1st Bn., 8th Arty. 1LT John F. Wetherell, Co. A, 125th Sig. Bn. 2LT George P. Rogers, Trp. B, 3rd Sqdn., 4th Cav. CWO Boyce W. Allen Jr., Co. E, 725th Maint. Bn. WO Paul T. Rogers, HHC, 725th Maint. Bn. SGT Leroy Buford, HHC, 2nd Bn. (Mech), 22nd Inf. SGT David R. Huddle, 25th MI Det. SP5 David J. Dalton, Co. C, 65th Engr. Bn. SP4 Jerry L. Beckham, 188th Avn. Co.
SP4 Michael J. Beirne, HHC, 2nd Bn. (Mech), 22nd Inf. SP4 Frederick J. Carraturo, Co. A, 2nd Bn., 14th Inf. SP4 Jose I. Garcia-Mocdonado, Co. C, 2nd Bn., 12th Inf. SP4 David A. Haraldson, Co. C, 1st Bn. (Mech), 5th Inf. SP4 John J. Hermanowicz, HHC, 2nd Bn., 12th Inf. SP4 Charles F. Johnson, HHC, 1st Bn., 27th Inf. SP4 Daniel M. Kasten, HHC, 1st Bn. (Mech), 5th Inf. SP4 Bohdan Kowal, Co. C, 4th Bn., 9th Inf. SP4 John W. McCoy, HHC, 2nd Bn., 12th Inf. SP4 Peter J. Nicolini, HHC, 1st Bn., 27th Inf. SP4 Ronny L. Palmer, HHC, 1st Bn. (Mech), 5th Inf. SP4 Joseph D. Prince Jr., HHC, 1st Bn., 27th Inf. SP4 Bickett O. Wade Jr., Co. C, 2nd Bn., 27th Inf. PFC William W. Bednarz, Co. C, 2nd Bn., 27th Inf. PFC Joseph J. Borick, Co. C, 2nd Bn., 14th Inf. PFC Thomas A. Brynelsen, HHC, 1st Bn. (Mech), 5th Inf. PFC Bobby W. Cameron, Co. A, 2nd Bn., 14th Inf. PFC John S. Cartwright, HHC, 1st Bn. (Mech), 5th Inf. PFC Ralph W. Crytzer, HHC, 1st Bn. (Mech), 5th Inf. PFC Paul L. Cyr, Co. B, 4th Bn. (Mech), 23rd Inf. PFC Harold E. Fetner, 188th Avn. Co.
PFC James H. Flickinger, Co. B, 1st Bn. (Mech), 5th Inf. PFC Mack E. Gregory, Co. C, 1st Bn. (Mech), 5th Inf. Vietnam is no picnic, but it can be a pig roast. It can also be concerts, pool tournaments, first run movies from the states, classes in Vietnamese, ice cream, bingo, birthday parties and free cigars. The place where all of this can and does happen is Ilikai East, the 25th Inf. Div. 's Hawaiian-style Service Club, located on Schofield and Taro Roads. To the discerning pleasure-seeker, Ilikai is the answer to many otherwise uneventful evenings. Besides the aforementioned activities, it offers a chance to simply unwind in pleasant surroundings. Those who find a poker game too taxing might enjoy the less strenuous, but equally engrossing pastimes of downing a cold beer on the patio, or watching TV. For music lovers, Ilikai offers the opportunity to join in on impromptu jam sessions, with instruments, including piano, that the club furnishes on request. Thanks to the untiring efforts of people like Mary K. Jensen, the club's program director, Ilikai is able to present a full and varied schedule of activities, with something new each day. Ilikai East is open from noon to 10 Monday through Saturday, and 10 a.m. to 10 p.m. on Sunday. You're always welcome, whether you want comprehensive R&R information, a progress report on the new club-sponsored swimming pool, or just a soft seat. More than one year ago the 25th Div. moved lock, stock and barrel from Schofield Barracks in Hawaii to Cu Chi. With the 25th came its PX. Today there is little left to remind us that our base camp once was a peanut plantation. The 25th has since grown to one of the largest divisions in Vietnam. The Cu Chi PX has kept up with the mushrooming division by growing to meet the needs of the men. The main exchange started with only one officer and 16 enlisted men. Today there are three officers, 50 enlisted men, and 70 Vietnamese employees. Also there are many more personnel staffing the 13 annexes located throughout the division. There is even a mobile PX that serves the various units and two van air conditioned barber shops. The main PX is in the process of being remodeled. Just recently the left side was completed and opened. Now they are working on the right side. The work should be completed soon, at which time the entire building will be utilized. Also the men will be shopping in air-conditioned comfort. The long range plans for improving the PX include; a snack bar to be built where the barber shop now stands and the electronics and photographic departments will be moved into the main building. The PX at Cu Chi has come a long way since its humble beginning more than a year ago. The PX staff has done and is still doing an outstanding job of serving the men of the 25th Inf. Div. The Army has revised its criteria and procedures for entry into the Army Aviation. Program to allow a greater number of individuals to apply. Army Regulation 611-110, "Selection and Training of Army Aviation Officers," which has been approved for publication, includes two major changes. The new regulation permits captains to enter flight training, provided the applicant was a lieutenant when he applied for the training. Formerly, with a few exceptions, only lieutenants and warrant officers could enter flight training. Now an officer with 42 months or less of active commissioned service can take this training. The other major change permits a lieutenant stationed overseas to apply for flight training at any time. He then may be returned to the Continental United States upon completion of one year overseas. DAU TIENG - Mr. and Mrs. Arnett of Naylor, Ark., are primarily responsible for mixups presently occurring in the 2nd Bn., 12th Inf. 's Bravo Company. A newcomer to the unit is usually pleased to discover that his squad leader is to be a Sergeant Gary Arnett from Naylor, Ark. To his dismay, however, after a couple of days of preparation and training he meets Arnett in the mess hall and receives nothing but a blank stare. What this new trooper is not aware of is that the blank stare he has just received came from SGT Larry Arnett, Gary's identical twin. Since their induction into the Army at the Old Post Office Building in Little Rock, Ark., in December 1965, the Arnetts have traveled together. Their first assignment found them stationed at Fort Lewis, Wash., in the 2nd Bn., 12th Inf., for basic and advanced individual training. Additional training followed AIT in preparation for the battalion's deployment to Vietnam as an integral fighting unit of the 4th Div. 's 3rd Bde. Promotions as well as awards have come simultaneously to the twins to include PFC, SP4, Acting SGT, and finally SGT. After three months of active duty in Vietnam the Arnetts were awarded the Combat Infantryman's Badge. In keeping with their dual status, basic training produced identical weapons qualification as each fired expert with the M-16 rifle and sharpshooter with the M-14 rifle. Just recently both were recommended for the "Cross of Gallantry with Bronze Star," a Vietnamese award for valor in the face of the enemy. The action took place in conjunction with operation "Gadsden," as each was involved in an ambush which required rapid deployment of their squad as well as continued direction of their fire until the enemy had been subdued. The twins will continue to befuddle incoming troops until September when they depart the country for the United States. 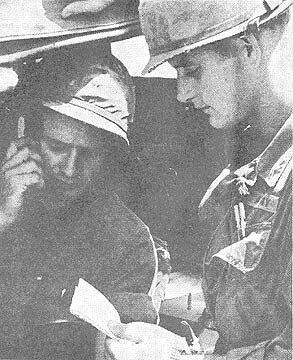 Despite the confusion and comical situations they may have caused throughout their tour in the Army, Larry and Gary Arnett have demonstrated a similar leadership ability. DAU TIENG - Turning their rifles into prodding sticks the men of the 3rd Bn., 22nd Inf. recently rounded up 150 cattle from the Michelin Rubber Plantation during Operation "Diamond Head." The cattle were believed to be a source of food for the Viet Cong in the plantation. A seal was thrown around the area just north of the 3rd Bde., 4th Inf. Div., base camp early in the morning. Regional force troops then went into the villages, gathered the people who were to be relocated and the three mile cattle drive to Dau Tieng began. The Ivymen unaccustomed to "far eastern" cattle-herding techniques, had their share of trouble with the unruly beasts. As they drove through the village, the cattle strayed from the herd and were led into houses by villagers who saw a good chance to get a steer on the hoof. It took several infantry-type sweeps to keep the herd heading in the right direction. At one point a stray was bull-dogged by a six-foot, 210 pound infantryman who literally "took the bull by the horns." Shouts of "El Toro! El Toro!" rang from his fellow soldiers. Near the end of the drive a grenade was thrown into the herd by a Vietnamese woman. No casualties were reported during the small stampede started by the blast. The cattle are now being held in Dau Tieng until the resettlement of the refugees is completed. 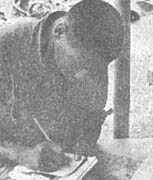 DAU TIENG - When PFC David Walker of the 3rd Bn., 22nd Inf., 3rd Bde., 4th Inf. Div. opened his mail recently he received a pleasant surprise. One envelope contained letters from the 2nd grade of a Catholic elementary school in Milwaukee, Wis. Sister Kevin Marie, Walker's cousin, aided them in their project. The yellow onion skin paper was colorfully decorated. One girl had drawn a picture of the "Monkeys" on her letter. Even more delightful, inspiring, and sometimes humorous were the children's messages. Steve S. Writes, "We are praying for all the soldiers in Vietnam. You do hard work." Janet L. needs a question answered, "I wonder how the war started and how the soldiers did it. We will pray for you." Donna writes, "We're praying for you in church every day. We are working hard. I am being good. I like to play. I hope you and the soldiers are having a good time." The messages are sincere. No matter what they say, as letters are read and reread, a smile comes across a soldier's face. While relaxing under his poncho during Operation "Barking Sands" SP4 Emmanual Sanchez of Keyport, N.J., had quite a shock when an enemy rifle grenade plummeted from the sky and made a direct hit on his steel pot. The grenade failed to detonate and Sanchez suffered only a few scratches and sore neck. Just a few minutes later while the 2nd Bn., l4th Inf. soldier was standing next to a fire discussing his close call with friends, a "C" ration can exploded in the fire and sent tin fragments and peanut butter into his side. Unshaken by the incidents, Sanchez began scraping off the peanut butter and laughed the whole thing off. PFC Robert Connolly of Philadelphia, Pa., stopped for a routine lunch break recently while on a patrol with the "Golden Dragons" of the 2nd Bn., 14th Inf., taking part in Operation "Manhattan." Soon after he sat down to "enjoy" a C ration meal, his platoon came under heavy automatic weapon fire. Connolly was unhurt and returned to the 25th Div. 's base camp at Cu Chi. A while after returning a friend asked him for a drink of water. He pulled out his canteen and was surprised to find there was no water it it. When he shook it, it clanked. Inside was one of the Viet Cong sniper's bullets. Another bullet was imbedded in the metal canteen. "It felt as though someone were trying to yank it out of my hand," said SP4 Richard W. Ray of Lancaster, S.C. of an incident involving his M-79 grenade launcher and a Viet Cong .30 caliber machine gun round. On a recent sweep with the "Golden Dragons" of the 2nd Bn., 14th Inf., 25th Inf. Div., during Operation "Barking Sands," Ray's squad came under enemy machine gun and automatic weapons fire. As he was crawling forward to join the battle, an enemy round shattered the stock of his M-79. Ray was not injured, however, and proceeded to assist his friends in driving off the guerrilla ambushers with his still operational grenade launcher. The American squad suffered two casualties, both minor injuries. VC casualties are not known but the fleeing enemy did leave blood trails indicating that they suffered casualties. SHOT THROUGH THE POT! - On his first day with Co. C, 1st Bn., 35th Inf., 3rd Bde. Task Force, 25th Inf. Div., PFC Robert L. Fields of Lakeland, Fla., received the closest call of his life. Fields was attacking a hedgerow when he was hit. The bullet entered the front of his helmet and came out through the top, slightly grazing his head. "I was ready to throw my pot away, but now I'm a believer," said Fields. He said that he knew a bullet could penetrate a steel helmet, but didn't realize till now the protection it actually gives the infantryman. The scene is Armed Forces Radio Monday morning at 11:45. The happening is LIGHTNING TWO-FIVE, the 25th Inf. Div. 's own program for and about the men of the "Tropic Lightning" Division. It goes something like this. SSG Ray Hayes kicks things off with a few minutes of news about the units at the Cu Chi base camp. SP4 Mike Halloran then picks the pace with lively music. An interview with a 25th trooper adds extra variety to the show. Monday morning at 11:45. Listen for LIGHTNING TWO-FIVE. DUC PHO - "The need is there," says CPT Carroll P. Osgood Jr. of West Hartford, Conn.
Osgood, battalion surgeon of 1st Bn., 35th Inf., 3rd Bde., 25th Inf. Div., conducts daily medical treatments at the Duc Pho Village hospital. This is the only civilian hospital in the area which has a population of 70,000. To complicate the problem there are no Vietnamese or USAID doctors in the area. The people of Duc Pho had been deprived of medical treatment by the VC until liberation came by way of American troops. "The general health of the population is quite poor," comments Osgood, "but we are definitely helping some people." To improve the health and treat as many patients as possible, the captain has scheduled certain days for specific ailments. Making daily trips to the hospital, Osgood treats 50 patients a day. The building is small and can house 20 bed patients. There are two wards, one for pediatrics and one for the sick and injured. Several projects are under way to restore the plumbing and spruce up the wards, but supplies are hard to get. "Our facilities are limited but we can treat people with malaria, some infectious diseases, and common parasites, but seriously ill patients have to be evacuated to Quang Ngai," Osgood explains. Do Hau Luong, the local pharmacist, helps the captain communicate with the patients. There are five Vietnamese practical nurses and one midwife who work at the hospital. Of course medics are good at helping conduet the sick call. Duc Pho hospital is just getting started, but with help it will get the things it needs like lab equipment, antibiotics, antiseptics, intravenous fluid, scissors, forceps, bandages and even paint. A cry for help has been heard, Osgood needs help to answer it. As he says, "It is my profession. I enjoy it and we are definitely helping these people." Once in a while a mechanized vehicle has the tendency to become bogged down slightly in the mud of Vietnam. Sometimes it gets stuck. Near the Oriental River, a track of the 4th Bn (Mech), 23rd Inf. got more than stuck. It drowned. But with the spirit "Hell no, we won't leave it here" the Tomahawks joined forces with the men of the 725th Maint. Bn. to simply pull the vehicle out of the mud. Four "simple" days and five hectic nights later the M-113 was out of the predicament and up on solid gorund again. An M-88 Vehicle Track recovery was brought in and a cable was stretched to the track. Stretched isn't really the word. The closest the VTR could get was 500 meters from the stuck track. To start the operation one man had to swim under water to hook up the cable. Only one day was used to actually pull the machine out of the mudhole. The other three days were spent pulling it across rice paddies to hard ground. The nights were spent guarding the vehicles and the cable from the Viet Cong and trying for a high mosquito body count. Eventually the job was done and the men and the vehicles returned to the Cu Chi base camp for a major clean up job. Moral of the story: To free a muck stuck strac track use super troopers with an able cable. HERE SHE IS SKIPPER - The trooper and the flag on the stick mark the spot where the mechanized vehicle is located. It seems there was a rumor going around that tracks float. 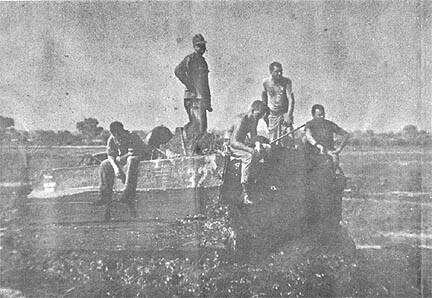 HEAVE-HO - The crew of the M-88 contemplates the track that was pulled off during the recovery operation. A cable was stretched some 500 meters from the VTR to the drowned track. RIDING HIGH AND DRY - A tired but most satisfied crew rides the vehicle through the mud and muck. A few boots lost shines in the five days spent in the area. LONG HAUL - The track was pulled more than 500 meters after it was out of the mud hole. This is a portion of the trail it left behind. Twelve men heavily slung with claymore mines, machinegun belts, and night vision devices, wound their way in through hidden gates in the rows of barbed wire. The twelve, tired but happy to be coming in, had just completed phase one of the final exam for a new school offered to potential leaders by the 1st Bn., 27th Inf., "Wolfhounds." The school, the Wolfhounds Leaders Orientation Course, offers men with leadership potential a means of turning that potential into fact. Three and a half days of concentrated training in all aspects of combat skills ends with an actual ambush patrol deep into Viet Cong territory. The school was formed in response to an increasing need. "Combat leaders on a squad and fire team level play a critical part in combat operations," explained battalion SGM Sidney R. K. Springer, "but often they are placed in the job with little command preparation." The Leaders Course is planned to give them just that preparation. Originated by battalion commander LTC Harvey H. Perritt, the school aims at filling the gap that exists between advanced infantry training and actual combat leadership. "The course includes as a review many of the points covered in the soldier's earlier Army instruction, but also totally new material that focuses on Vietnam fighting," said MSG Roy Burdette, director of instruction. The material learned in weapons classes is put to work in squad tactics instruction. Intelligence and leadership training teach important combat skills. Ambush, mine and tunnel training fill out the student's knowledge of Vietnam combat. The entire course is taught by battalion non-commissioned officers who themselves have served or are serving as combat leaders. "We feel that the men could have no finer instructors than the sergeants who are teaching these classes," said Springer. "They pass on techniques and a feel for combat leadership that you can't find in books." The students themselves all have combat experience. Each is chosen by his company because he has either served as a leader in the past or shows leadership potential. Most of the men have not yet served as leaders in combat, but many have been student officials in school or in civilian clubs. At first there were some doubts about the idea of teaching combat skills to men who had already fought the Viet Cong. "We have found that not only do the men learn new material, but they cement their knowledge of the all important combat fundamentals," said Burdette. Their field experience seems to make the men even better students. They maneuvered their way through the 25th Div. Mines and Boobytraps training course setting off only three out of a possible 40 traps. The impressive fact was that they did it in total darkness, the first time the course has been run at night. The final exercise, an actual ambush, gave the men a chance to plot the entire movement, including supporting mortar fire, and then actually carry out their plan. After the ambush and a one-hour written examination, the students returned to their companies ready to put their training to work. TAKING NOTES - (top left) One of the leadership students intently takes notes during the ambush class. FINAL EXAM - (middle, right) The men of the leadership course went their way out through the barbed wire protecting the base camp on their way to an ambush site. 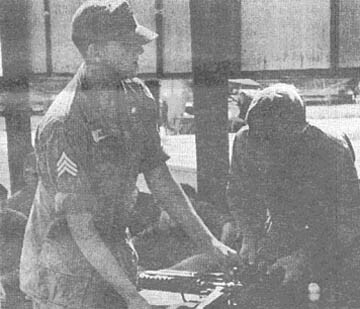 NOW NOTICE HOW THIS IS DONE - (bottom, left) An instructor directs one of the students in the disassembly of the M-60 machinegun. DAU TIENG - In ceremonies conducted at the Tay Ninh Base camp where the 2nd Bn., 12th Inf., is now located, the former 3rd Bde. executive officer, LTC James F. Greer assumed command of the battalion. Before the assembled troops, LTC Joe F. Elliott relinquished the position after six months as commander of the battalion. During his stay with the battalion Elliott directed numerous operations to include Operation "Attleboro", "Junction City" and "Manhattan." He was awarded the Purple Heart for wounds received during Phase II of Junction City when VC mortars began pounding the 2/12 perimeter. For his actions after being wounded in organizing his troops to aid battered artillery positions, Elliott was awarded the Silver Star. Both the Silver Star and Bronze Star for meritorious service were awarded at the change of command ceremony. COL Elliott's reassignment to the United States will find him at Fort Leavenworth. Kan., in the Department of Divisional Operations. He will serve as an instructor at the Command and General Staff College which usually involves a three year assignment. COL Greer accepted the command with the promise to continue the fine record which had been established by his predecessor. The ceremonies were conducted just adjacent to the operational headquarters recently vacated by the 196th Lt. Inf. Bde. who are now actively engaged in combat near the DMZ. DUC PHO - A touch of irony from the battlefield. This was demonstrated recently when the leader of a Popular Forces platoon was found to be the uncle of a survivor of a Viet Cong platoon. 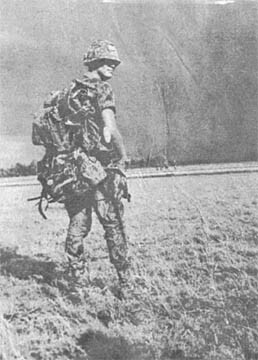 The RF platoon was operating north of Duc Pho when contact was made with the VC platoon. A heated battle ensued and only three VC survived. The next morning one of the survivors, To Tach, turned himself in to Co. A, 1st Bn., 35th Inf. The Hoi Chanh related that he was warned by his father that the PF had increased operations in the area. Disregarding the warnings, To Tach remained with his platoon. Quite frightened, To Tach explained, "I am a VC, but I want to return to my government. I have been a VC for two years, free to roam as I pleased. Then suddenly everything changes. I have been hunted day and night with little or no time to rest." Taken by chopper to the 3rd Bde., 25th Inf. Div., at Duc Pho for interrogation, he learned that his uncle was the Popular Forces leader. When asked what he plans to do now that his government has received him, he replied, "I want to join my uncle's platoon!" Three Viet Cong were killed and 14 weapons captured by the 2nd Bn., 49th ARVN recently southwest of Cu Chi in Hau Nghia Province. The ARVN unit was supported in the action by the 25th Inf. Div. 's 2nd Bde. The Vietnamese unit made contact soon after dismounting "Huey" helicopters. In the fight that resulted the three VC were killed and two more were captured. Six sub-machineguns, five Russian carbines, one French assault rifle, a .45 pistol, and one unidentified weapon were captured. The ARVN unit is working in the Operation "Kolekole" area of the 2nd Bde. Three Vietnamese children hit with shrapnel from a Chinese Communist concussion grenade probably owe their lives to the quick action of the men of Btry. A, 3rd Bn., 13th Arty. 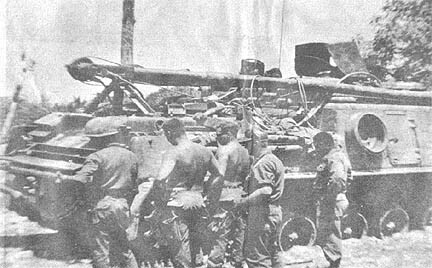 The battery of 155mm howitzers was stationed outside the village of Cau Nga Ba in support of the 3rd Sqdn., 4th Cav. A loud roar approximately three hundred meters beyond the perimeter interrupted the noon meal and sent soldiers scurrying for cover. "I just knew the kid was hurt," said SGT Glen Miller explaining his actions. Miller of Allentown, Pa., ran across the unsecured field to reach one of the boys who staggered a few steps and collapsed following the explosion. Miller was closely followed by SFC Robert Lockhart of Ukiah, Calif. Together they started bandaging the badly injured child in an effort to stop the severe bleeding. Meanwhile medic Robert Blount of Sylvania, Ga., and CPT Douglas Dakan, the battery commander, were treating two other children who tried to reach the artillerymen for help. The three youngsters were taken to a Special Forces camp at a nearby sugar mill and evacuated by helicolpter to a hospital at Cu Chi. "We received word later that all three had pulled through and would recover," said Dakan with a grin. In what one soldier described as an old fashioned charge, Co. C, 2nd Bn., 27th Inf., killed six Viet Cong, two by body count, and detained seven suspects. The action resulted when an estimated two Viet Cong squads fired on a "Wolfhound" ambush patrol southwest of Cu Chi. The 25th Inf. Div. 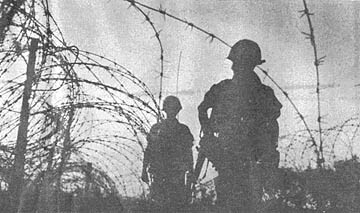 patrol began taking sniper rounds soon after reaching night position. Fire was returned with small arms and mortar rounds. One Viet Cong was killed. When enemy firing increased indicating more than a small group of snipers, Co. C formed up on line and assaulted the enemy position. The fight that resulted netted five more Viet Cong killed. Seven Vietnamese civilians found in the area were detained for questioning. DAU TIENG - Our country's third highest award for valor, the Silver Star Medal, was awarded to LTC Joe F. Elliott, commander of the 2nd Bn., 12th Inf., on June 1, just prior to his departure for the United States. The action cited took place on March 21 during the battle of Soui Tre in conjunction with Operation "Junction City," in Tay Ninh Province. During the e a r l y morning hours of the 21st the battalion was subjected to a heavy mortar attack at their forward location. While giving instructions to his company commanders along the battalion perimeter, Elliott was wounded in the right hand. Upon receiving an urgent request to reinforce two friendly units located 2000 meters to the southwest, Elliott reorganized his forces and deployed his men toward the objective. Disregarding his wound and refusing medical evacuation, the colonel joined his lead elements to effectively control his command. The "Battling Builders" of Bravo Co., 588th Engr. Bn., recently completed a perimeter road inside the once rat-infested artillery camp at Soui Da. The 1st Plt. was assigned the job. They moved in and started to work. Within a matter of days, drainage ditches were cut, areas drained, and a road utilized to supply the all important artillery pieces of the camp was starting to take shape. It was brought to the attention of the engineers that several cases of plague had erupted in the camp. The cause was many garbage sumps located just outside of the camp were flooded most of the time and a real haven for the rodents that carry deadly fleas that transmit plague. The engineers went to work immediately to drain the areas, cover them over and to set out rat poison. Since that time, not a single case of plague has been reported. Upon completion of the project, all people, weapons and ammo were left high and dry. Everyone was well pleased with the job except the camp cats! DUC PHO - Under heavy fire from two squads of Viet Cong, a downed crew from a UH-1B reconnaissance helicopter from Trp. B, 1st Sqdn., 9th Air Cav., owe their lives to the courage and quick action of Charles R. Cole Jr., the chopper's door gunner. For his action, SP4 Cole received the Silver Star, our nation's third highest award for valor, presented by MG William B. Rosson, commanding general of Task Force Oregon, in a ceremony at the tactical command post of the 3rd Bde., 25lh Inf. Div. Cole's ship was shot down during a low level reconnaissance mission near Duc Pho in Quang Ngai Province. The aircraft, on impact, broke into four pieces and caught fire engulfing the crew in smoke and flames. The 20-year-old SP4 helped the pilot from the burning wreckage before the crew was separated by the smoke. Endangering himself Cole began an unrelenting search for the rest of the crew. He located his wounded crew chief about five feet from the chopper and dragged him to safety. In an effort to secure protection for the wounded man the young West Virginian ran across an open field under a hail of enemy fire to grab an M-79 grenade launcher from the burning craft. 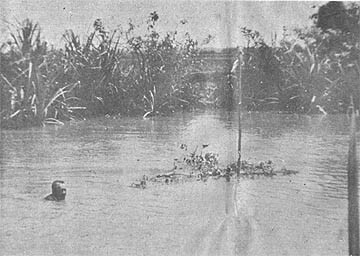 Organizing a defensive position behind a rice paddy dike he held off the VC for 15 minutes before more aircraft arrived to rescue the crew. Maintaining a machinegun and running a weapons squad is a busy job. SP4 Timothy A. Kissane from Des Plaines, Ill., has done both for the past six months. Being the backbone of his platoon, Kissane is always in demand during contact with the Viet Cong. "Knowing when and where to fire and keeping my gun clean in the swamps are my major problems," remarked Kissane. After leaving Viet Nam Kissane will have one year remaining in the service. He would like to become a Drill Instructor. The machinegunner is a member of Co. B, 2nd Bn., 27th Inf., "Wolfhounds." DAU TIENG - Little is said, but much is expected of those jacks-of-all-trades - the combat engineers. Their work is important in the job of maintaining mechanized mobility for the 3rd Bde., 4th Inf. Div. The 1st Plt., Co. C, 4th Combat Engrs., has the mission of assisting the 2nd Bn. (Mech), 22nd Inf., in the field. Whenever there's a bridge to be built, roads to be cleared of mines, bunkers built, or booby traps safely destroyed, the job falls on 2LT Walter H. Petrie from St. Clair Shores, Mich., and his engineers. One of the most important jobs, at least in the eyes of the mechanized troops, is the road clearing operations. With three-man security teams to the front and both flanks, men such as PFC Stewart W. Isaacson from Watota, Wash., slowly sweep their mine detectors down an uncleared road. Engineer SSG Obel D. Nazario-Almodevar from Puerto Rico, commented, "The Viet Cong mines I have run into are pretty ingenious. One we dug up the other day was a wooden box about 10 inches in diameter, and contained plastic explosive, nails, and iron chips. It was hidden near the river bank." It was approaching the end of the day, but the engineers' work was not finished. They had to go out and destroy some mortar rounds that had malfunctioned and fallen just outside the battalion perimeter. The engineers are also responsible for bridge building. On the present operation, the armored personnel carriers of the "Triple Deuces" crossed a river on which there was an armored vehicle launching-bridge site. After clearing the road of mines, the engineers prepared and set the bridge in place. As they walked by his APC, SGT John L. Jasinski of Danbury, Conn., Co. A, 2nd Bn. (Mech), 22nd Inf., commented, "I never thought much about the engineers - until I saw them in action. The men appreciate their abilities, and we are damn glad to have them in the field with us." The movement of troops and critical materiel to the major base camps of the 25th Inf. Div. reached new proportions this week as Air Force C-123 transports were added to the inventory of scheduled flights. 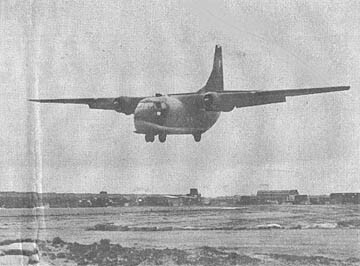 Three flights daily by the Tan Son Nhut based 19th Air Commando Sqdn., connect base camp airfields at Cu Chi. Tay Ninh and Dau Tieng with Bien Hoa and Tan Son Nhut. Until the resurfacing of the Cu Chi Airfield last month, air traffic was restricted to scheduled flights of CV-2 Caribous. Passenger and cargo movement, according to Air Force CPT Robert Breitenfeld, the tactical air liaison officer, has jumped from 25 to 60 passengers per flight or 10,000 pounds of cargo. He added that the network of air fields within the division can now handle the Air Force's large four-engined turbo prop C-130s under emergency troop movement conditions. The Caribou flights will continue to carry cargo, MAJ Robert McCleave, division transportation officer, remarked, but the C-123s will be concerned mainly with the movement of replacements and getting soldiers to Tan Son Nhut for further shipment to the states or R & R centers. "Please help me . . . " began a letter written by Ngo-thi Gai, a 16-year-old Vietnamese girl who had lost both legs in a Viet Cong mine explosion. The letter was addressed to the doctors of the 12th Evac. Hosp. who had treated her after the bus in which she was riding struck a VC mine. Gai's mother was also seriously injured and her older brother was killed. Though she was bleeding badly, quick action on the part of the hospital staff saved her life. However, With the aid of the United States Agency for International Development (USAID), Cai will soon be walking again. Working through the 25th Inf. Div. civic action program, USAID will provide her with artificial legs and teach her how to use them. CPT Ellen Langston, head nurse of the Vietnamese wards and from Laconia, N.H., recalls "It is very hard for her to accept the fact that both her legs are gone. Gai has been told she will get new legs and be able to walk again, and this makes her very happy. She does not yet fully understand just how it will all be accomplished, but through the hospital's interpreter she has made it known that she trusts the American soldiers who have been so kind to her." "I want to finish high school and become a school teacher," Gai has said. And now, with the help of USAID and the tropic lightning division, she will be able to realize that ambition. CHU LAI - BG Richard T. Knowles relinquished the reins of the 196th "Chargers" in recent change of command ceremonies. Assuming command of the light infantry brigade was BG Frank H. Linnell. The Legion of Merit was presented to GEN Knowles as representatives from the organic and attached units to the brigade stood at attention. Making the presentation was MG William B. Rosson, Task Force Oregon Commander. GEN Knowles paid tribute to the officers and men of the brigade for their accomplishments during operations Attleboro, Cedar Falls, Gadsden, and Junction City. As the men stood smartly at "parade rest," he asked the brigadesmen to give GEN Linnell the same loyalty and support given him. Concluding his farewell address, the general said, "If you are going to stay ahead of the rest, keep your spears up and keep charging!" DAU TIENG - MSG Ronald G. Therriault's return to duty in Vietnam saw him actively involved in the 2nd Bn., 12th Inf., as the intelligence sergeant. In November of 1966 when the 2/12 relocated to Dau Tieng, near the famed Michelin Rubber Plantation, Therriault returned to the area where he had fought once before as a senior advisor to an ARVN battalion. Functioning as the battalion intelligence sergeant from the very start of his second tour, Therriault continually relied on the vast experience of eighteen years of service to mold his section into a functioning unit. Recognizing the need for improvement and innovation within his own section, Therriault trained new members of the S-2 section as intelligence specialists to work directly with the rifle companies; They also formed the basis of a long-range reconnaissance unit, the first in the 3rd Bde. This idea proposed and developed by Therriault resulted in the S-2 section of the 2/12 receiving, on several occasions, the personal compliments of the brigade commander. 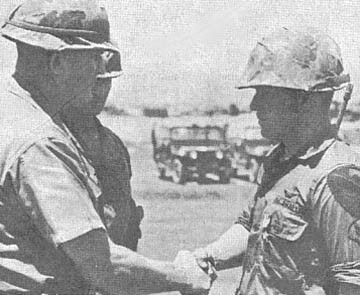 The sergeant's knowledge of the Vietnamese people and facility with the language were instrumental in establishing the rapport that the battalion presently has with the local population. A very likeable person with a keen wit, he provides battalion headquarters with just the right combination of devotion to duty and enjoyable mirth. Dual combat assaults by two companies of the 1st Bn., 27th Inf. "Wolfhounds" killed nine Viet Cong and captured one Chinese carbine recently southwest of the 25th Inf. Div. base camp at Cu Chi. The action took place along the winding Oriental River in a swampy portion of the 2nd,Bde. Operation "Kolekole" area. Companies B and C made dual combat assaults on either side of a small stream. Co. B, commanded by CPT Larry Garlock, met stiff enemy resistance as assault helicopters swept them into their planned landing zone. The enemy broke and fled when the company returned fire and pursued on foot. 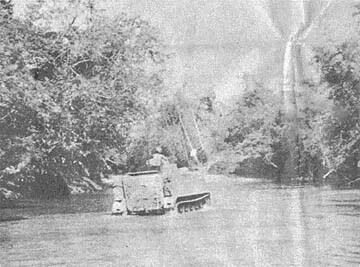 The Viet Cong attempted to escape by swimming across another stream to the south of the American units. They were cut off when artillery blanketed the escape route and Co. C was helilifted into a blocking position. In the fighting, six Viet Cong were killed by Co. B, and three by Co. C, commanded by CPT Clifford W. Steelman. The remainder of the Viet Cong force fled into the heavy undergrowth along the Oriental River. Only two U.S. infantrymen were wounded in the action. CPT Warren K. Hendricks, Jr. has assumed his new position as administrative assistant to MG John C.F. Tillson III, commanding general of the 25th Inf. Div. Hendricks replaces CPT William F. Kelly, who has assumed command of Btry. A, 1st Bn., 8th Arty., at Cu Chi Base Camp. Prior to his assignment in Vietnam, Hendricks served as the aide-de-camp to the commanding general of the Third Inf. Div., in Wurzburg, Germany. He is a 1963 graduate of Ripon College, Ripon, Wis., and holds a bachelor of arts degree in economics.